This Greek artist was born in Corfu where at the age of 7 he joined the world renowned Mantzaros Philharmonic Society remaining as an active member until a few years ago, playing clarinet and saxophone. Later he studied piano, guitar, keyboard and bouzouki, as well as synthesis and orchestration. 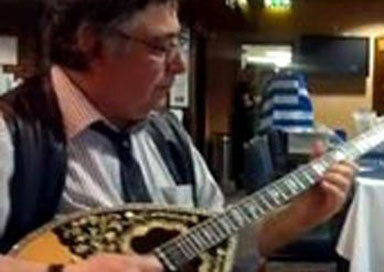 He performs as a one man band playing bouzouki along to a backing that he has synthesized and orchestrated himself. Greek bouzouki holds the principal role resulting to a high quality prof performance and the repertoire is specially designed for a British audience. As his repertoire is very demanding, vocals are not included unless singers are trained or tasted, through rehearsal, by him. However, he include vocals and guided audience's participation in Greek dancing at no extra cost. A Greek dancer can always be added into his performances but not by him or on his expense. In 2006 he decided to introduce the "Live Greek popular music theme night" aiming to offer the real taste of the Greek music culture. The concept epitomized in the proper instrumental performance of not only the very famous old Greek pieces of music but also famous modern hits that currently played in the best bouzouki tavernas in Greece. The repertoire is continuously updated, the music played by every single instrument in his virtual band, in every single, is orchestrated/mixed separately (live and no loops) and the bouzouki is played live. He also performs Italian repertoire from the 1960' 1970's and 1980's with orchestrated backing on synthesizer.